Hi SmartFans, my name is Brett Goldberg, and I’m the co-founder of TickPick. As one of the top few sellers of Super Bowl tickets each year in terms of volume, we have become a go-to source for football fans to find out how to secure the cheapest Super Bowl tickets, as fans save 10-15% over competitor sites because we NEVER charge the buyer any service fees. In order to better serve football fans interested in buying Super Bowl 53 tickets, I have taken to answering questions submitted by those subscribed to our Super Bowl Newsletter that will be sent out on a daily basis from here on out. In this newsletter, you will get the answers for when the best time is to buy Super Bowl tickets, as well as details around our Super Bowl tickets pickup and when you can expect to receive your Super Bowl 53 tickets. And lastly, some insights into what’s been happening the last 48 hours and what to expect for the next week. Q: I bought tickets from you guys the last 2 years, but I don’t recall these fluctuations. Prices on Saturday were about 2600? Now prices are about 3300? What happened? A: Leading into the weekend, it appeared that demand was soft. However, demand surged this weekend. We saw a similar trend last year, but this year it was even more extreme. Over the weekend we had more sales than we did throughout all of last week. Q: We are looking to spend basically $2,200 a seat or less (to get in). Do you think this is something that will happen? If so, what is your best estimate of when (day wise) prices will fall to this number? A: To answer your question: it’s tough to say, given how prices have changed these last several days. Over the weekend, we had more sales than we did throughout all of last week (Monday-Friday). It really all depends on if the higher demand continues or not. With that said, I don’t think you see $2,200 get-in prices this week. Whether that happens late into the weekend is the question. 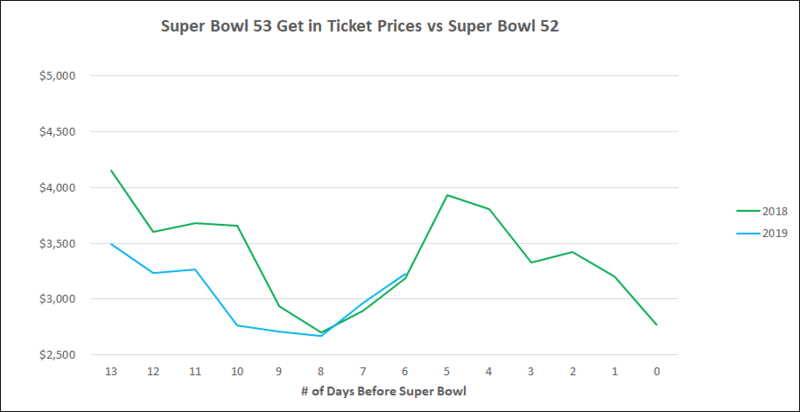 Check out the graph below that tracks the average Super Bowl ticket prices leading up to game day over the past four years. The chart below helps illustrate the price fluctuations between this year and last in the days leading up to the game, up to two weeks out. Q: When’s the best time to buy Super Bowl tickets? A: If you haven’t bought yet, you need to decide if you are willing to play this waiting game. I’ll be honest; as a fan, I personally don’t enjoy the roller coaster ride of Super Bowl tickets and the price fluctuations. If you’re not comfortable waiting to buy tickets until late into this week, you should strongly consider buying now. I say that because from a momentum perspective and the amount of inventory makes me believe we’ll see prices increase before they decrease. However, if you have patience and aren’t in a rush, I’d likely wait, as I don’t believe these get-in prices will hold. With that said, it’s most important for you to come to your own conclusions and trust your own gut. Q: When can we pick up tickets purchased from your site? I like having my tickets in hand before game day. A: As long as you buy your tickets before Friday afternoon, we’ll have them ready for pickup by Saturday afternoon. If you buy tickets before Saturday afternoon, we’ll have them ready first thing Sunday morning. And if you wait until Sunday, we’ll have your tickets ready within 1-2 hours (as we get closer to kickoff, delivery times will be quicker). Pay attention to our pop up, as that will regularly change.